The music box teased in a Nintendo vine is not a preorder bonus. Zelda Producer Eiji Aonuma opened a palm-sized treasure chest to the familiar chime in a vine Nintendo of Europe posted one week ago. The short video suggested the music box would be a pre-order bonus for The Legend of Zelda: A Link Between Worlds. However, GAME, the UK game retailer, has revealed that the music box is only included in the collector's edition of the game ordered through its stores. The collector's edition will cost Â£49.99. 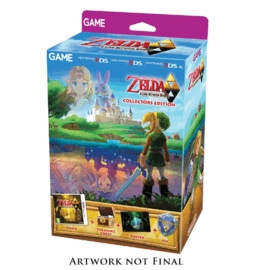 The collector's edition includes a boxed copy of A Link Between Worlds, a download code for Link's Awakening DX, the music box, an a glossy poster exclusive to GAME. Link's Awakening DX takes up 55 blocks (6 MB), and the download code will be issued per order instead of per copy of the game. In addition, the code will be issued to buyers via email once the order has been confirmed. Once this has occurred, it will be too late to cancel pre-orders for the collector's edition. Link's Awakening is an earlier Zelda title, first on the Game Boy; Link's Awakening DX, a remake, was first on the Game Boy Color. The game does not take place in Hyrule, nor does it feature Princess Zelda. Link is shipwrecked and must collect items and go through dungeons to find a way home. A Link Between Worlds launches on Nov. 22 for the 3DS.